The "thought screen helmet" is our only defense in a "telepathic war." I call this device a "thought screen helmet" because it prevents aliens from performing any kind of mental control over us It blocks out all alien thought so humans can no longer be manipulated or controlled, and it prevents aliens from completing mental communication with us so people cannot be abducted. 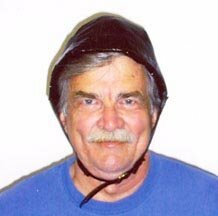 The helmet from Stop Alien Abductions (as worn by abductee Jon Locke - pictured) costs you $35 (US) to build, but as they say, it is essential if we are to win the telepathic war against the alien invaders. With that in mind, I though it prudent for me to create my own version of their model. I intended it to with a cheaper, but nonetheless, effective helmet of my own. It is made with electrical tape and an ice cream container. Hat Tip - L>T for the link.